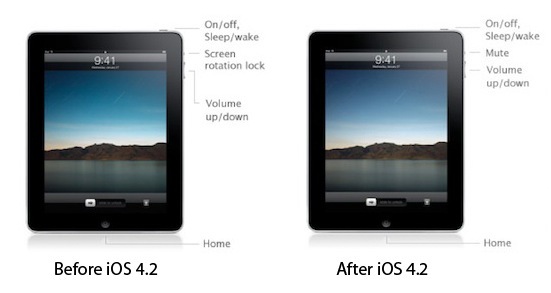 A few minutes ago Apple announced the release of iOS 4.2 today. The download links aren't live yet, and we speculate the engineers at Cupertino will flip the switch at 10AM PST. 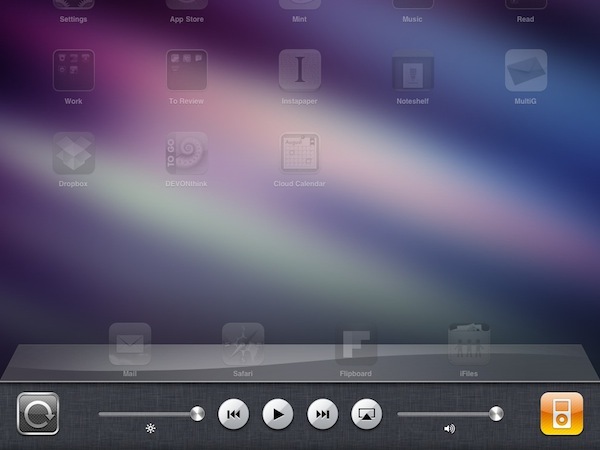 In the meantime,though, you can check out our complete iOS 4.2 for iPad walkthrough below. We have tested iOS 4.2 through all the betas and GM seeds Apple released, and there's no doubt this is the OS we were all waiting for. iOS 4.2 is a major new update for iPhone, iPod Touch and iPad built on the strong foundation of iOS 4, released in June just two days before the iPhone 4 went on sale. iPhones and iPod Touches have been capable of enjoying multitasking, folders, fast app switching and the hundreds of new features since then, but it’s only with 4.2 that iPads are getting updated to support iOS 4. This new software update marks the grand unification of iDevices under a single OS, which comes with lots of new functionalities for the tablet, and a couple of interesting additions on the iPhone. In this article we’ll take a look at everything that’s new in iOS 4.2 on the iPad, with a mention of the minor updates for the iPhone and iPod Touch as well. 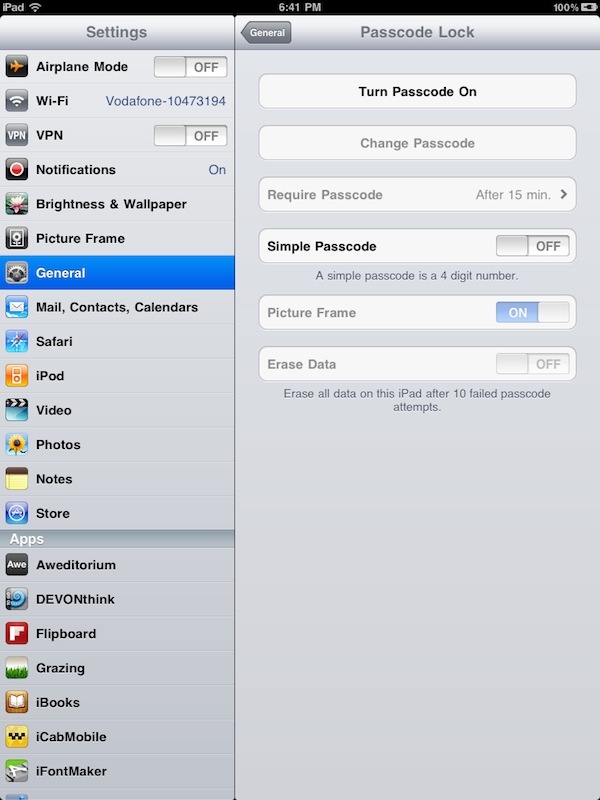 So read on past the break, and follow us along the ultimate guide of iOS 4.2 for iPad. First off, let’s start with the hardware. Well, of course the hardware isn’t changed. It’s a software update, remember? That doesn’t mean, though, that Apple can’t re-purpose specific hardware components to play different with the software. And in fact, to unify phone and tablet owners under a single interaction method, the iPad orientation lock button has now become a mute switch. Many users didn’t take the news very well (admittedly, I think an orientation lock made more sense with the iPad form factor) but Steve Jobs confirmed this is not a change that’s going away anytime soon. 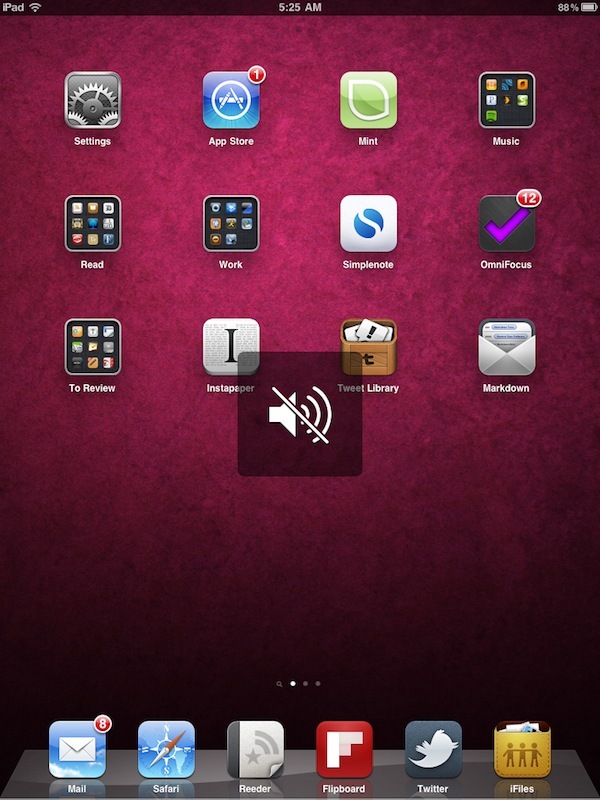 The mute switch for iPad is here to stay. It’ll be a little awkward for existing iPad users at first, it’ll be a welcome change for previous iPhone users. An orientation lock button is available in the multitasking bar with a single swipe to the left. 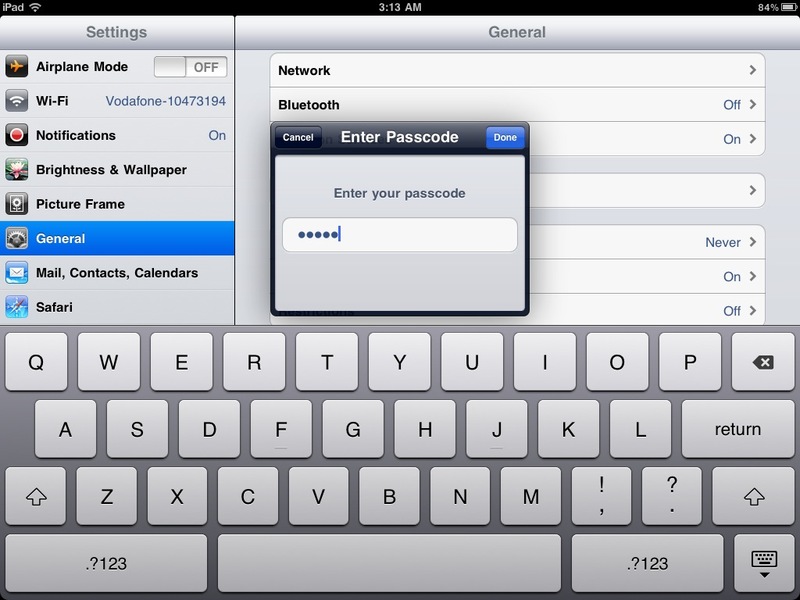 AirPrint is one of the major new features in iOS 4.2, both for iPhones and iPads (and yeah, the iPod Touch too). Basically, you can now print from iOS. Anywhere in the OS, whether you’re checking out a photo, a document or a webpage and if you happen to have a compatible shared printer on your local network -- you’ll be able to print with just a few taps. Unfortunately, printing to an TCP/IP device isn’t possible at this moment, as confirmed by another Steve Jobs email. Also, Apple removed support for printing to a printer shared on OS X, so you'll likely be able to print only with some HP printers for now. The user interface and functionalities of AirPrint are rather simple and straightforward. From the action button (also known as “share button” in some applications) you can hit “Print” and the operating system will look for an available printer on your network. If there’s one -- or multiple ones -- you’ll be able to send a document to it. You can also add multiple documents to the print queue, and access the print menu from anywhere by opening the multitasking bar and tapping on Print Center, Apple’s dedicated app to manage print queues. 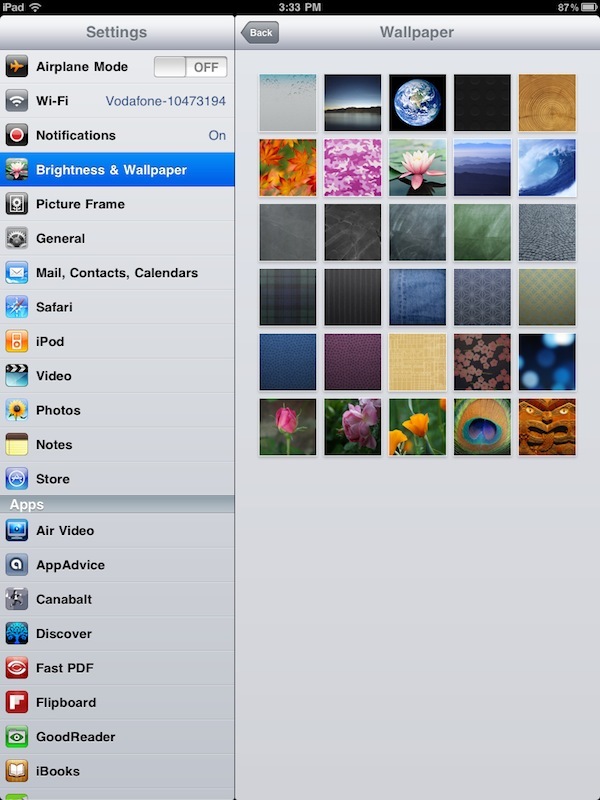 AirPrint works in the Photos app, Safari and 3rd party apps that support the feature. This one’s a biggie. AirPlay is Apple’s re-imagination of how you can enjoy media on your devices -- movies, music, online videos -- using an advanced streaming technology that can send audio and video information from any device (iOS devices and Macs, too) to Airport stations around the house and the new Apple TV. With AirPlay, you can start watching a video on your iPad while on the train, finish it on the Apple TV once you’re home. Efforteless streaming built into the OS, in every app. That’s right, AirPlay works anywhere there’s a standard iOS media controller, meaning iPod app, videos, iTunes, the Youtube app or Safari. 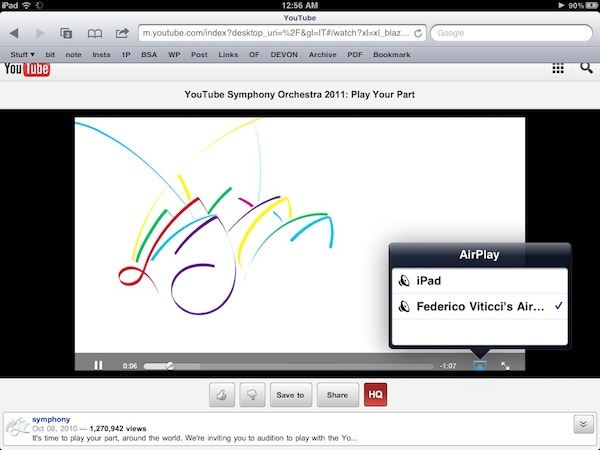 Anytime there’s a song or video that you can play on iOS, you can now stream it using AirPlay. 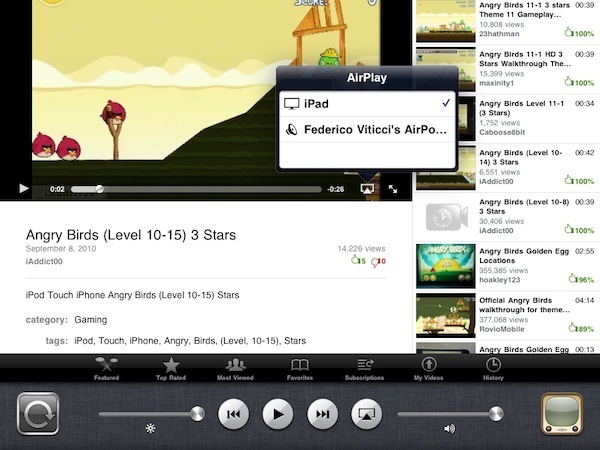 Apple initially enabled AirPlay in every app but then removed it from Safari in iOS 4.2 beta 3. Many feared AirPlay was not going to be as system-wide as Apple had promised. Fear not. With the final public build of iOS 4.2, available today, AirPlay is enabled in every app, no matter if it’s an app you downloaded from the App Store or a web app. To use AirPlay, all you have to do is make sure you have an AirPlay-compatible device running on your local network. An Airport Express station hooked up to your stero system is fine, for example. Once the Airplay “receiver” is up and running, pick up your iOS device, fire up a video or a song and hit the AirPlay button in the media player. The audio and / or video will be streamed to the receiver. That’s it. Works evereywhere, with every app, with every iOS-compatible media format. Many tout AirPlay as the future of mobile media consumption. 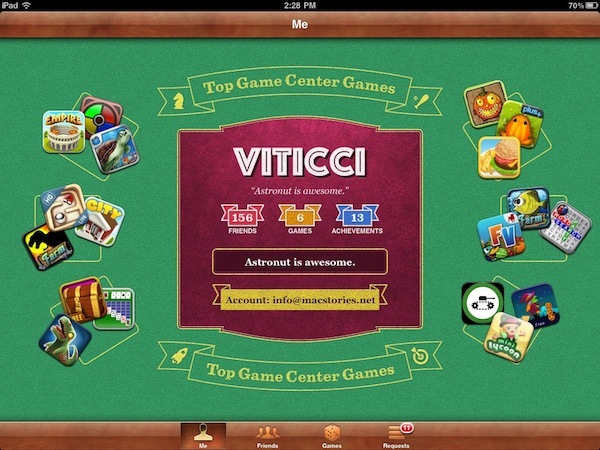 Dear iPad owners, this is what you’ve been waiting for. 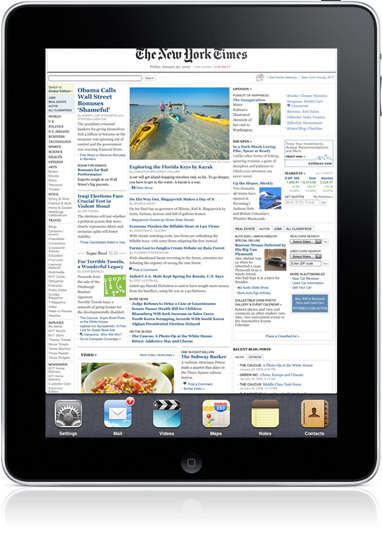 Multitasking and folders come to the tablet, with a bigger interface and enhanced capabilties in spite of the iPad having less RAM than the iPhone 4. 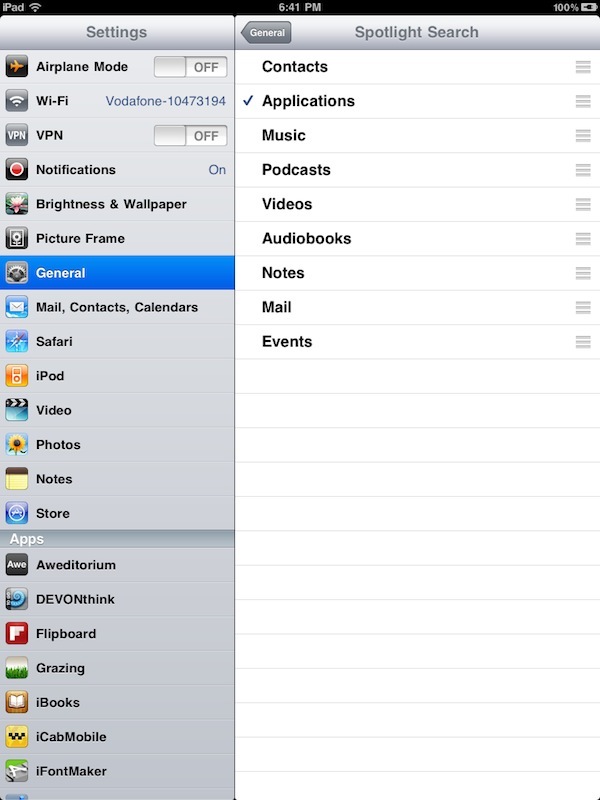 We don’t know exactly how, but Apple managed to make iOS 4’s multitasking as fast and snappy as the one we started enjoying on the iPhone 4 in June. The iPad needed multitasking. So here it is. Multitasking doesn’t tell the whole story, though. To understand Apple’s implementation, think of apps as single entities living on a layer (the OS, you guessed it) capable of quickly switching between them. That is why Apple calls its own implementation of multitasking “fast app switching”. You don’t see multiple apps running at the same time, like you can on the desktop. You still see one app at a time, but you can switch between apps without losing what you were doing before. Apps can now store a “persistent state” and they can perform minor task in the background. For instance, you can open a Flickr app and select some pictures to upload, then you close the app. When you come back, you’ll find the app exactly as you left it, but the pictures have been uploaded. Two iOS 4 features have been deployed here: fast app switching (with the persisten state) and the task completion API, which allows apps to continue doing stuff in the background for a limited period of time -- around 10 minutes. That’s why the pictures were uploaded. So that leads us to the basic concept underlying Apple’s multitasking implementation: apps are “paused” when you switch between them, and they can perform actions in the background if it’s needed. It’s a simple, yet genius implementation that doesn’t require an app to be running the whole time (thus draining a lot of battery and eating a lot of memory), but still lets you quickly close and open apps without losing “their state”. All of this happens with the multitasking tray you can invoke by double pressing the home button. Just like on the iPhone, the multitasking tray opens at the bottom of the screen, whether you’re holding the iPad in landscape or portrait mode. The multitasking tray can store as many apps as you wish in order of recent closing -- you can think of it as a way to switch between recent apps. 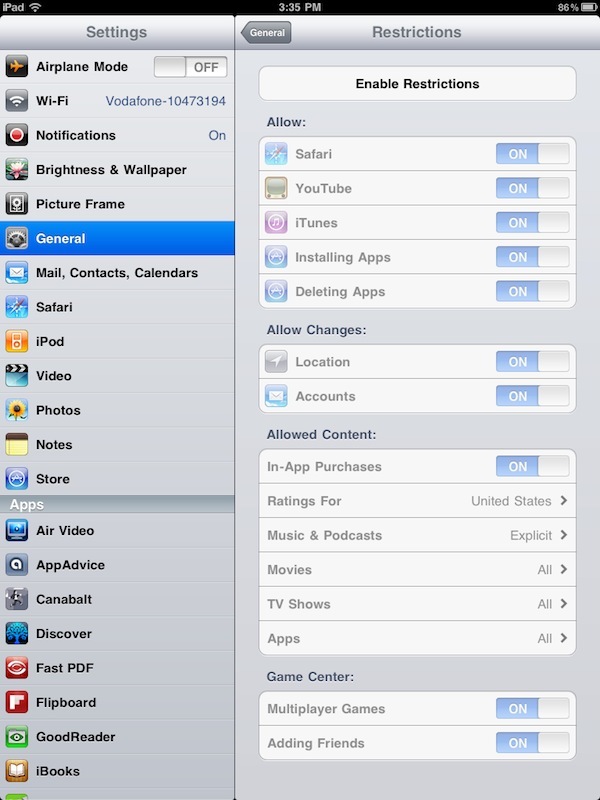 On iOS 4, anyway, you can also completely quit an app: just open the multitasking tray, tap and hold on an app's icon, then hit the little red button that appears. The app will no longer be paused and its state won’t be saved. 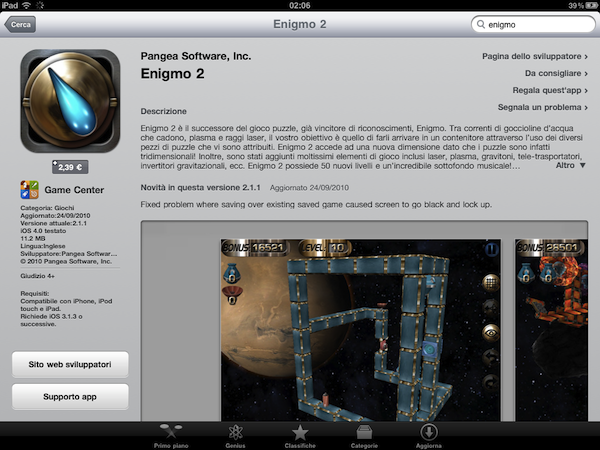 Something we love about iOS 4.2 for iPad? The redesigned “app switching” animation. It’s beautiful. 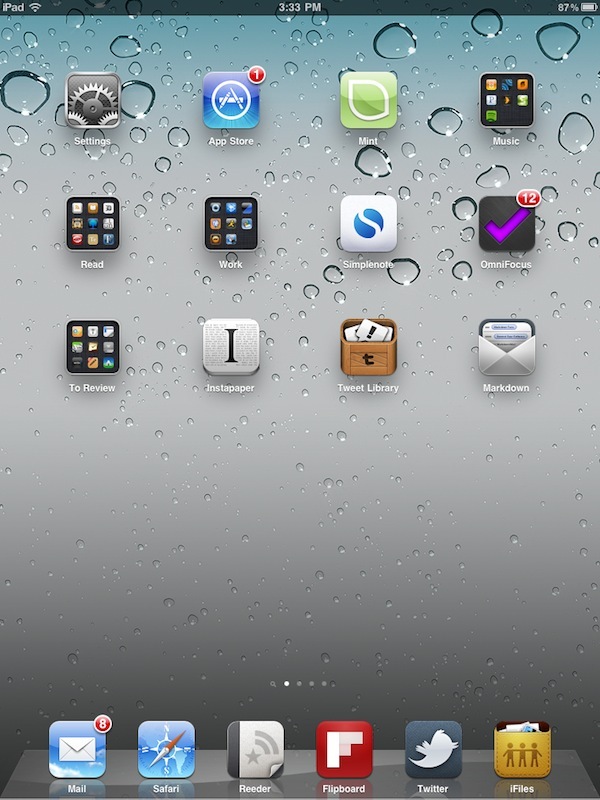 Some apps that already support iOS 4.2 multitasking? 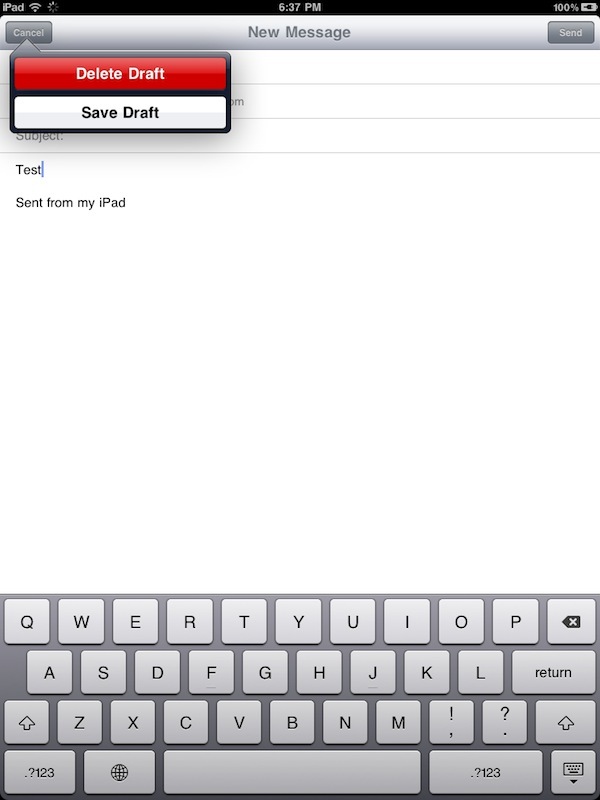 OmniFocus, Reeder, Tweet Library. Another neat feature of iOS: local notifications. They’re similar to push notifications (actually, they look just like them), but they don’t require an active internet connection to pop up on screen. 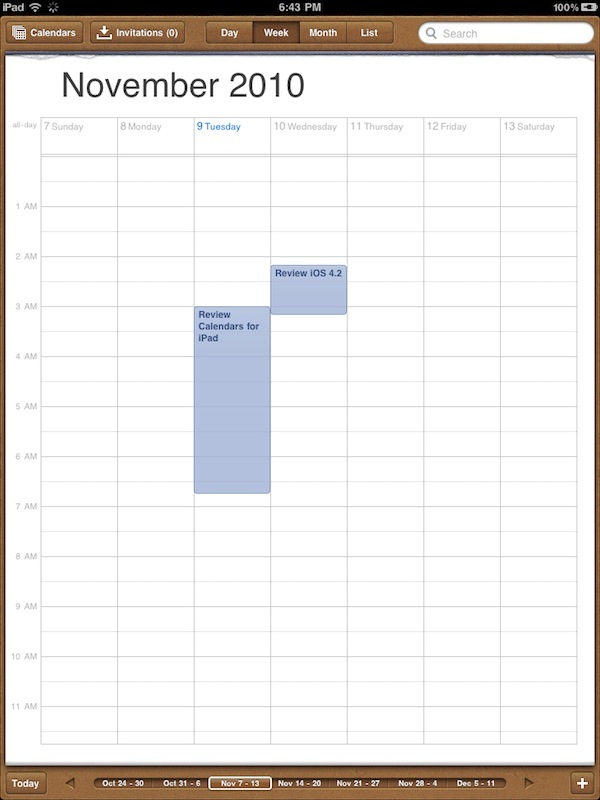 Apps updated for iOS 4 can send users local notifications for upcoming appointments and tasks (OmniFocus, iCal), or notify them that a task has been completed (ex. upload to Flickr or Facebook). Third-party music apps such as Spotify and Pandora can now play audio in the background -- a feature previously reserved to first party software such as the iPod app or Safari. Then we have folders. On the iPad, you can store up to 20 apps inside a single folder, but you can’t put a folder inside a folder. Only apps. 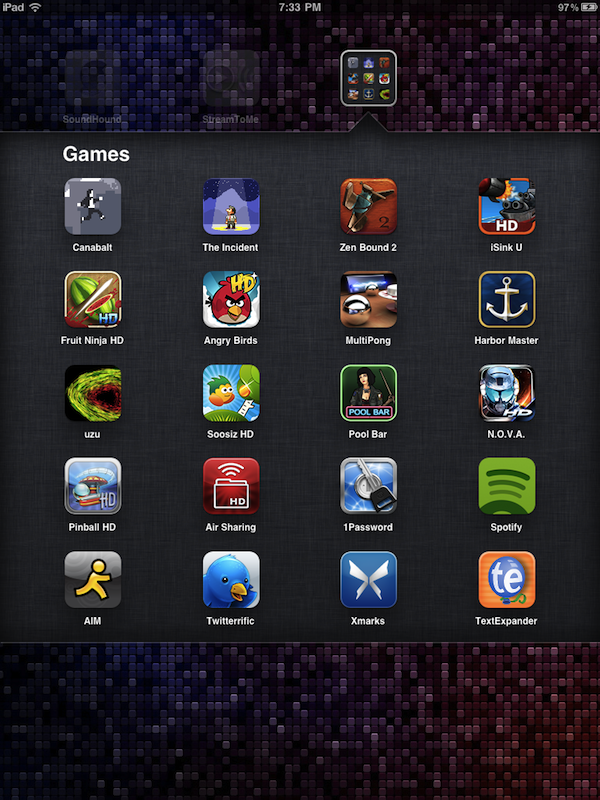 To create a folder, enter the “wiggle mode” (tap and hold an icon on the Springboard) and drag an app onto another one. A folder will be created with a default name, usually based on the category the apps belong to (ex. OmniFocus and Things together will create a “Productivity” folder). A folder can be renamed at any time. Apps can be moved in and out of folders at any given time as well. The multitasking tray doesn’t stop at recent apps you’ve closed, though. With a single swipe to the right, in fact, you can access the leftmost part of the tray, where the “widget controls” reside. This section of the tray contains a bunch of stuff you can use to get ahold of your device’s orientation, brightness and volume. First off, there’s the aforementioned rotation lock button which you can easily guess what it does. Then there’s a brightness slider you can use anywhere in the OS you dim or enhance your screen’s brightness (useful with Instapaper at night). Then we have music controls, to quickly play / pause whatever audio the device is playing or jump to the previous or next song. Then there’s a volume slider, pretty self-explanatory, and the icon of the app that’s currently playing audio -- say iPod, Pandora or Spotify. Is Safari’s playing some MP3 or HTML5 audio file, you’ll find the browser icon in there, too. If you happen to have an AirPlay-compatible device on your local network, you’ll find the AirPlay button in the multitasking tray as well. 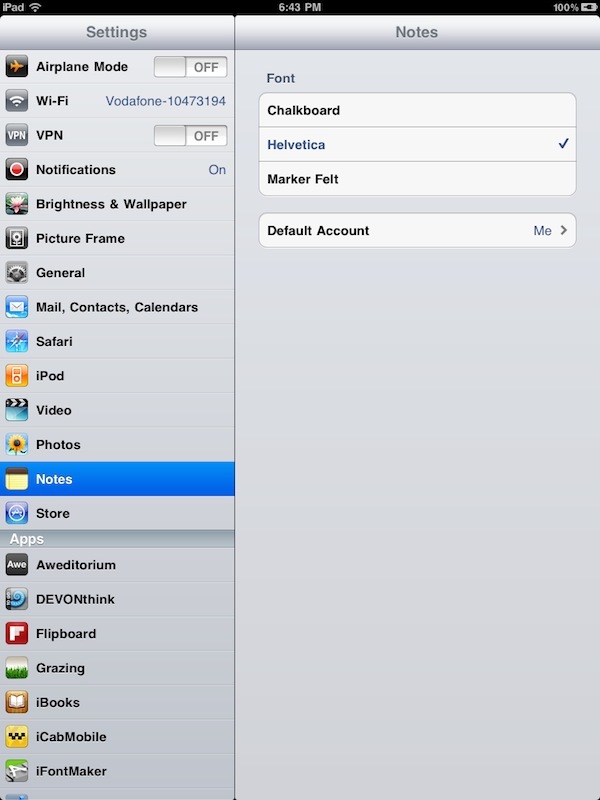 Last, iOS 4.2 allows VOIP apps to receive and continue calls in the background. When Skype’s running, for example, you’ll see a thin red bar at the top of the screen. 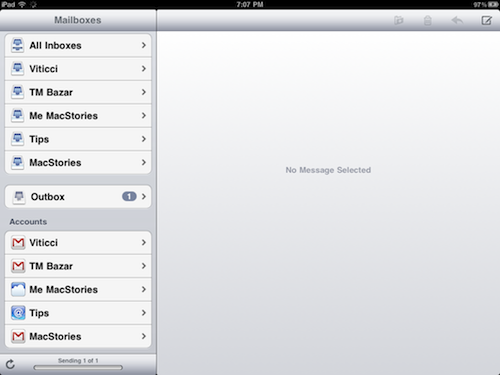 Mail app got a nice makeover in iOS 4.2, both on iPhones and iPads. First, you can now enable threaded messages in the Settings, so you’ll be able to see conversations with a contact in a single-windowed interface with all the messages assigned to that conversation sitting all together in the sidebar. In the main inbox, conversations get a badge to show you how many messages are inside. A very welcome change. 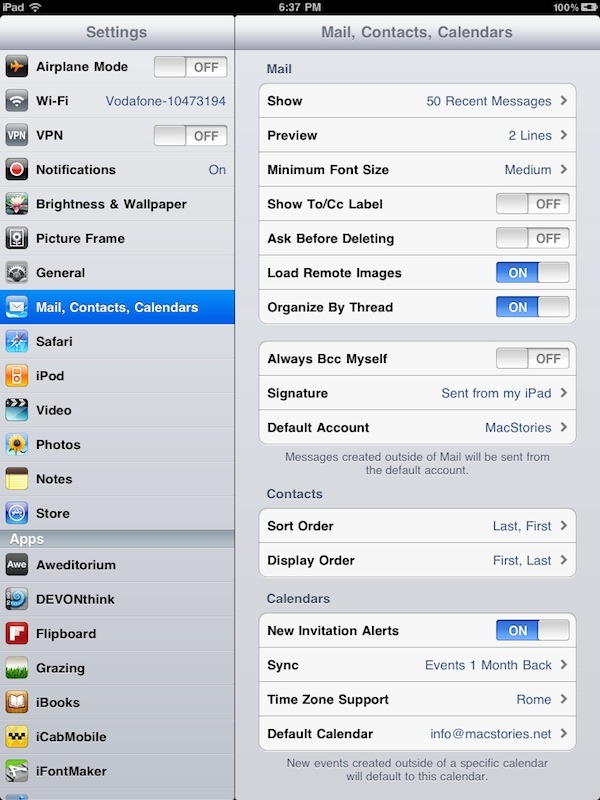 The second major feature of Mail in iOS 4.2 is “fast inbox switching”. You can still access your inboxes as you normally did, but now you can also skip the whole sub-folder navigation part (select an account, choose the inbox folder or another sub-folder) and jump directly to a simple list of messages awaiting for you in your account. Other minor additions include an optional Archive button for Gmail accounts instead of the usual Delete button, support for multiple ActiveSync accounts, and a “delete draft” button when discarding an email message. Safari didn’t receive any major interface update (sorry folks, no tabs! 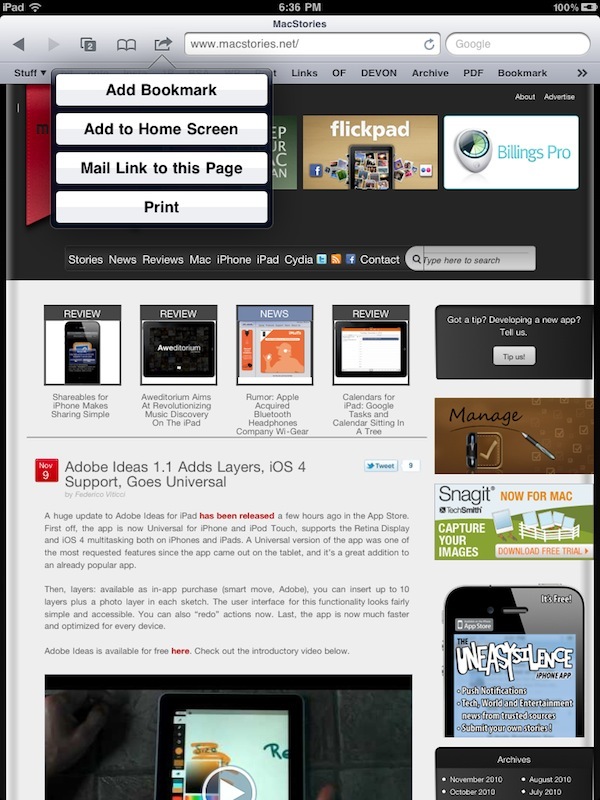 ), but two new little features made their way to Apple’s browser in iOS 4.2. You can now find specific words in a webpage, something iPad and iPhone users were forced to achieve through bookmarklets or 3rd party applications before. The functionality is built into the OS now. To “find in page”, place the cursor in the Google search field ( I know, weird. Why would I want to select Google to find an element in the current page? 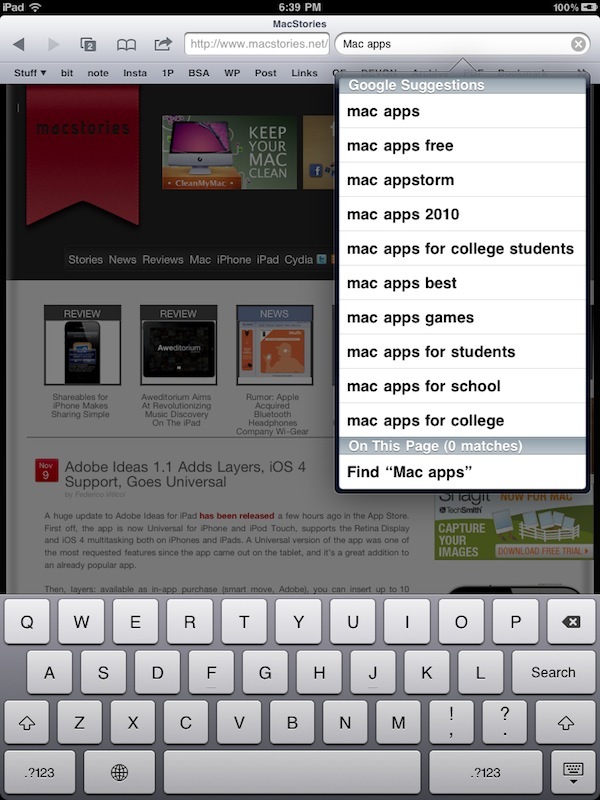 ), start typing, then select the “find in page” link at the bottom of the search popover. Safari will zoom in, highlighting elements in yellow and allowing you follow other elements found in the page by using a “next” button in the bottom bar that will appear. You can hit “done” to end the in-page search, or place the cursor in a page specific to search field to refine your search. The “+” button in Safari’s toolbar has been changed to an arrow action button containing Add Bookmark, Add to Home Screen, Mail Link to Page and Print. Also, the tab button is a little bit different now, and has a badge detailing the total number of open tabs. 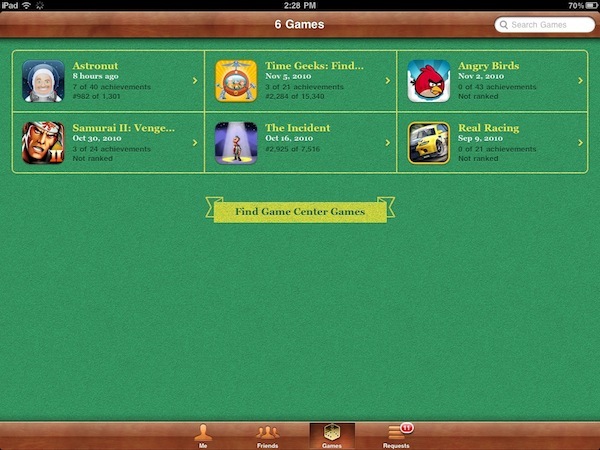 Game Center comes to the iPad with the release of iOS 4.2. Featuring a much bigger interface than the one we've already seen on the iPhone, Game Center for iPad allows you to check on your friends' updates and achievements, see Game Center compatible games, accept friend requests -- everything you'd expect from Game Center. It's just bigger. 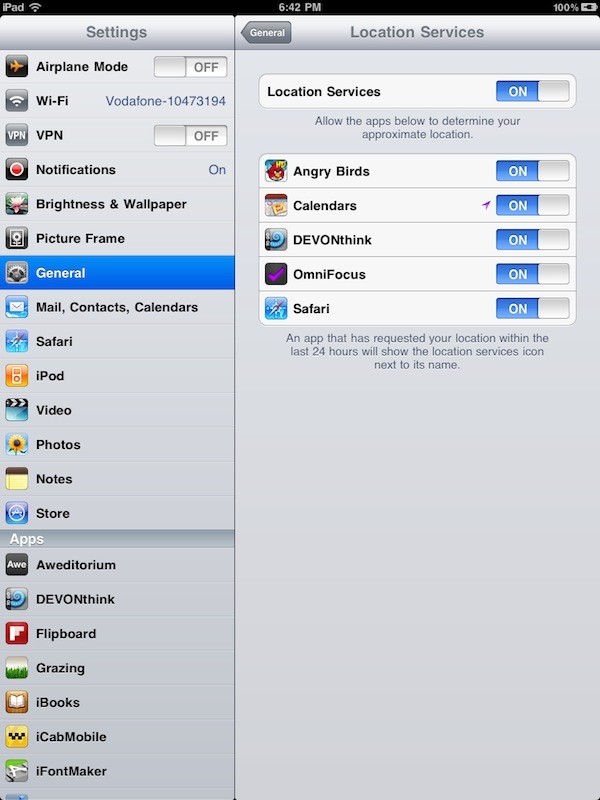 A bunch of refinments and additions made their way to the Settings app in iOS 4.2. Here they are, together with screenshots. Other minor new feature and subtle refinements to existing apps have been included in iOS 4.2. Most users won’t even notice, we think they’re cool enough to be listed here. Pastel shades in the Calendar, because we all know Steve loves the 80s. Good riddance, Marker Felt. You can now select other fonts to use in the Notes app, and I guess Helvetica has already won many hearts of iOS 4.2 beta testers and developers. 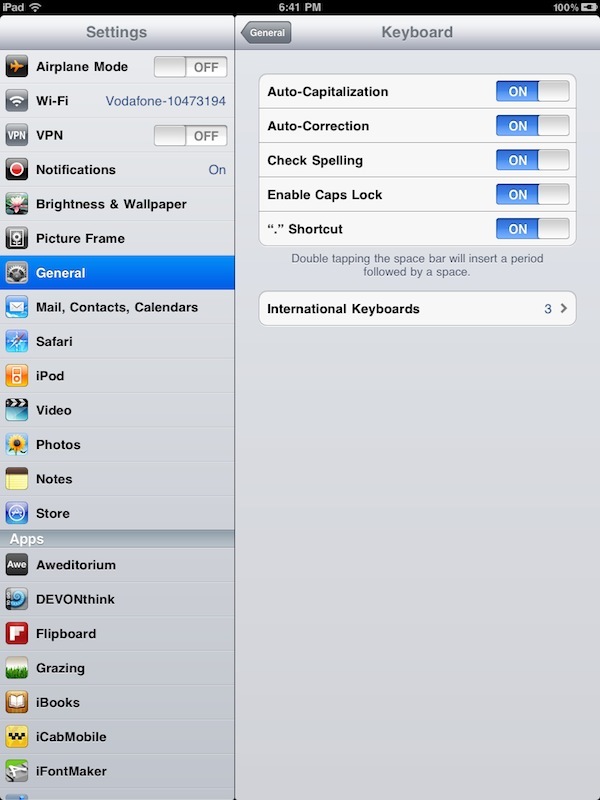 They thought I was crazy when I said the keyboard in iOS 4.2 looked slightly different. It turns out I was right, as Apple’s added a subtle drop shadow to make everything feel more tappable. 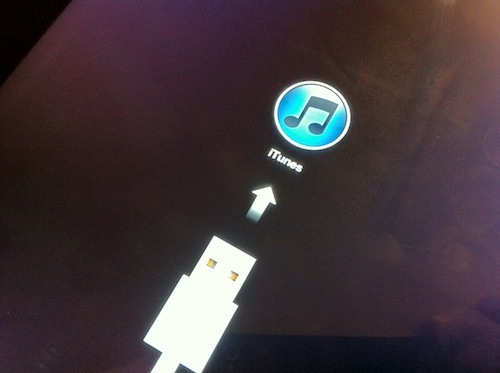 Yeah, no more old iTunes icon. It’s been a great run, CD. The famous bubble wallpaper is now crispier than ever. It’s not that Apple “changed the resolution” of iOS 4.2. They simply made this wallpaper, well, better. 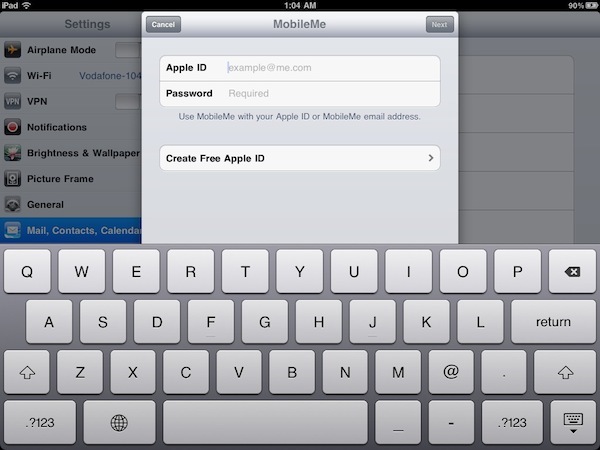 You can now use MobileMe with your existing Apple ID. This is part of Apple strategy to make Find My iPhone free for all iOS 4.2 users, and perhaps part of a greater plan to make some features of the entire MobileMe package free. iOS 4.2 is the update we've been waiting for. It unifies Apple's devices under a single, consistent and fast operating system, but most of all turns the iPad into the device it should have been since April. A portable machine capable of streaming, multitasking and printing. iOS 4.2 is a huge milestone for Apple, and a dream come true for users.